LOUISVILLE, KY — It was an amazing evening with Kim Campbell, wife of the late country music legend Glen Campbell, as she shared her personal Alzheimer’s journey. More than 450 turned out for the Morning Pointe Foundation and Morning Pointe of Louisville Senior Living campus event at Middletown Christian Church in Louisville, KY. 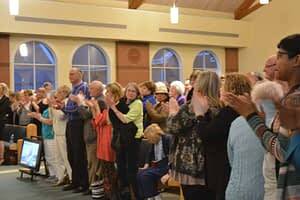 The free public awareness event ended with a standing ovation. Special thank you to Guardian Pharmacy and WHAS-TV 11.